As you know, SGI is based in Central London, close to Oxford Street and Regent Street. What you probably don't know is that we are actually in a neighbourhood known as Fitzrovia, a district with a wonderfully long and colourful history. Here's the first of many interesting facts about SGI's neighbourhood. The BT Tower Fitzrovia's most famous landmark is the 'BT Tower' - You can see this glassy tall cylindrical building (opened 1966) from all over London. In its early days it used to have a revolving restaurant and an annual race up the stairs of the tower. It is now used by the national telecommunications company British Telecom ( BT) as a communications hub. 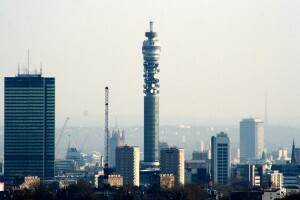 The BT Tower in the movies - In Harry Potter and the Chamber of Secrets, Harry is seen flying over the tower in an old English car ( a Ford Anglia) with his good friend, Ron Weasley.